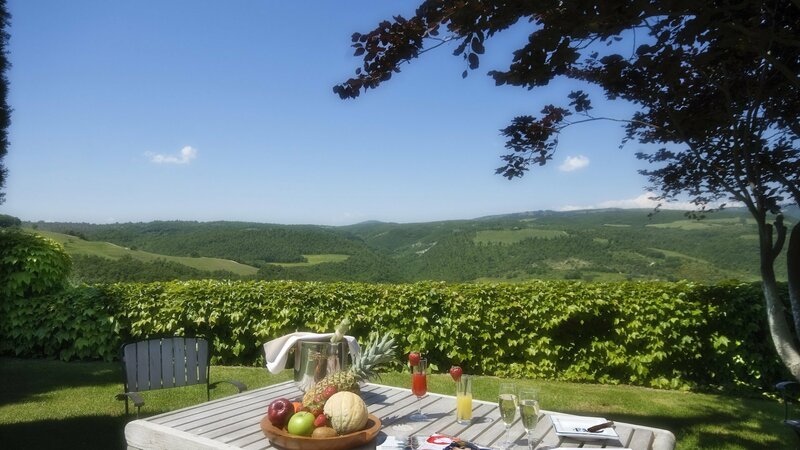 At the end of a cypress avenue protected by the woods, the ‘curtain’ of the Umbrian hills opens, a real postcard image that surrounds Alla Fattoria, including its guest houses. 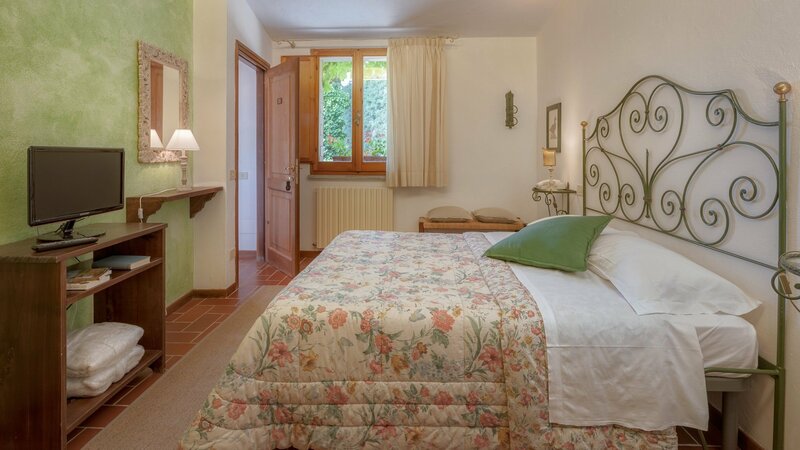 The villa is at walking distance to Doglio (2 kilometers distance), an ancient hamlet where you can find a grocery store and a butcher. 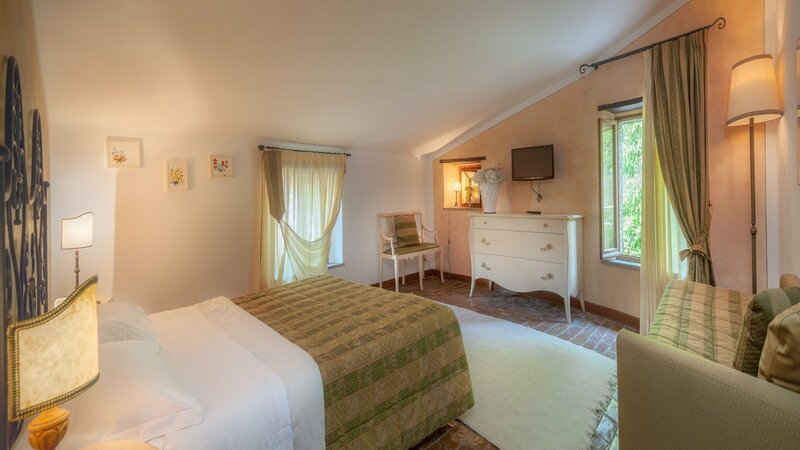 The whole property, with its two acres of land, partly garden and partly olive groves, looks out over the Natural Park of Monte Peglia which can be admired by from almost every room. To forget about the smog, the traffic noise, the cases of modern civilization is easy in this place, where nature infuses a sense of peace, involving the five senses with its colors, scents and sounds. 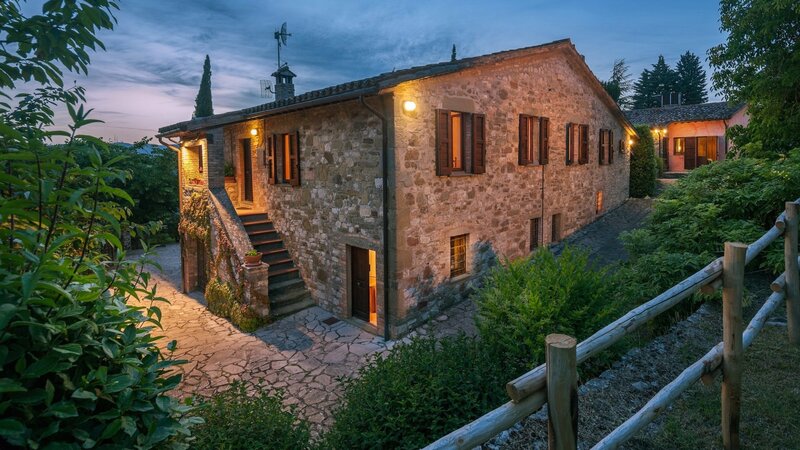 Until a century ago, this immense villa and its guest houses were the center of a farm, and today the main villa is the place where the day activities take place. Larges spaces are dedicated to the dining room, to the large kitchen made of steel and professionally equipped. 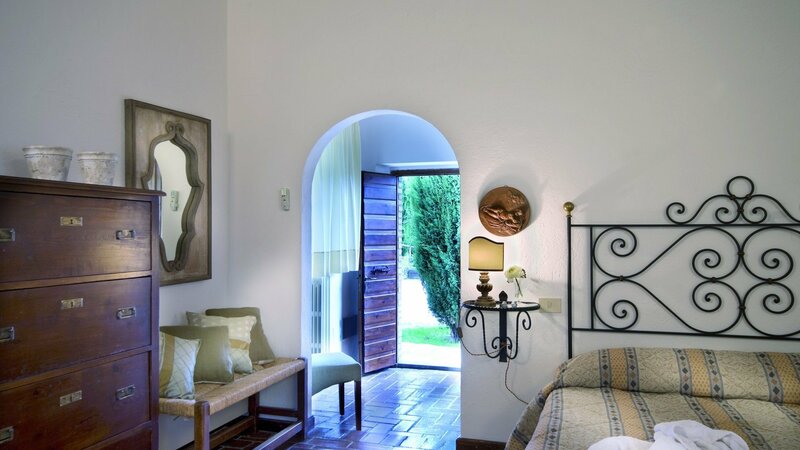 The villa is divided into a main villa with four bedrooms and three guest houses located next and behind the large main villa. The total number of accommodation is up to 31 people. 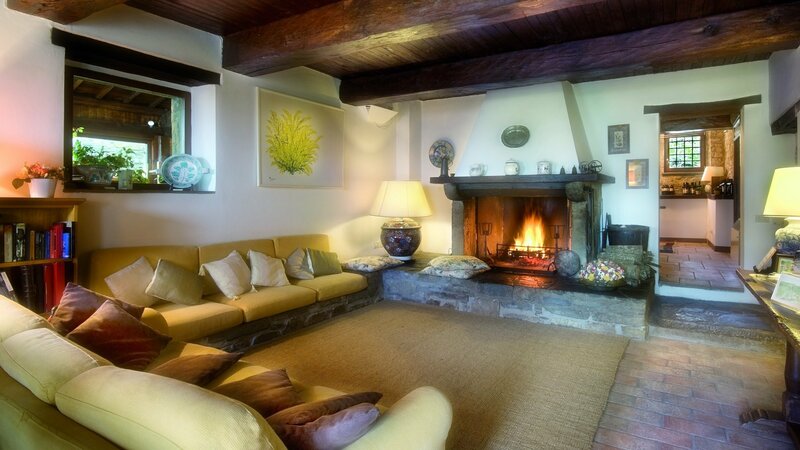 In front of the main villa, with access to the kitchen and living room, there is a spacious pergola. 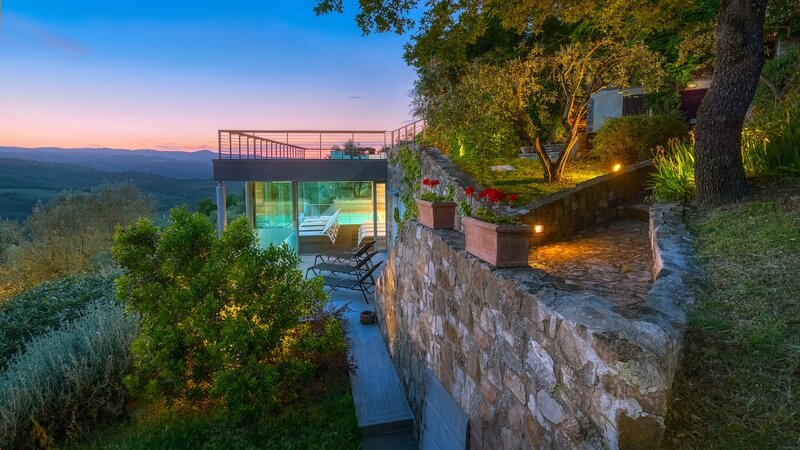 The villa has a large swimming pool of 16 by 8 meters, an indoor swimming pool with hydro massage area and a Turkish bath. The gazebo next to the outdoor swimming pool is equipped with a bar area with fridge, sink and a kitchenette. In front of the pool there is a pergola with a ping pong table and a gazebo where massages can take place. 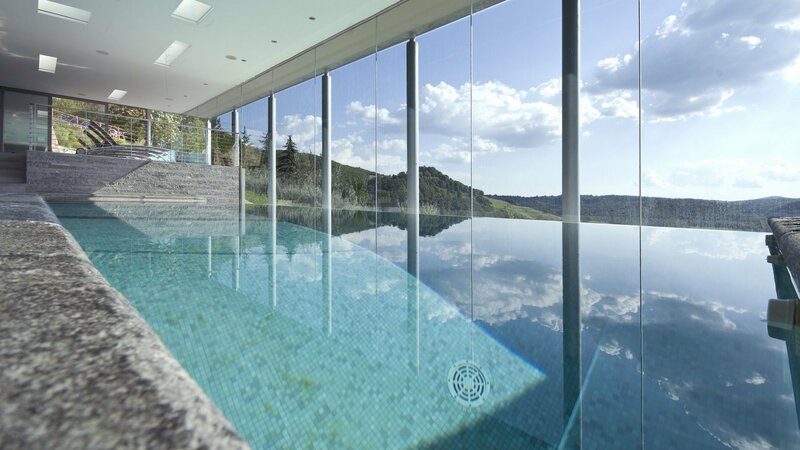 During the warmer months, instead of using the outdoor swimming pool, you can use the panoramic heated indoor pool of 11 by 3,5 meters, built in a contemporary style, where the architect’s goal is clearly visible; to use dark gray stones in order to enhance the beauty of the green color of the hills and the blue color of the sky. 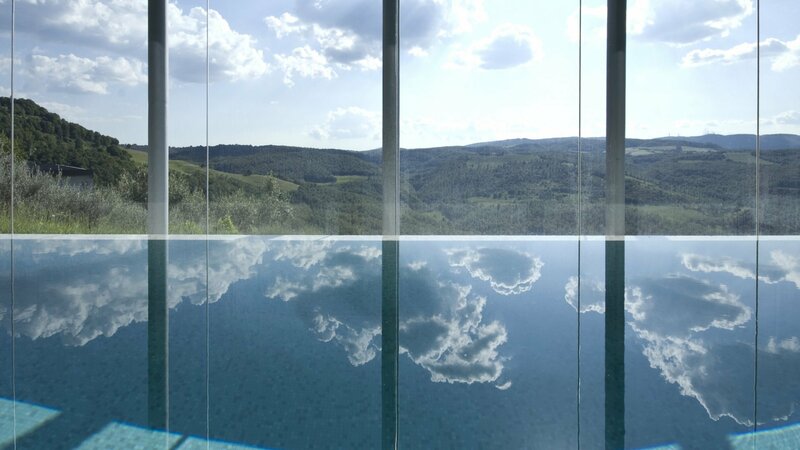 It features a hydro massage area, a Turkish bath, showers, dressing rooms and massage cabins. Behind the property there are other houses, occasionally occupied during the summer, which do not belong to Alla Fattoria. 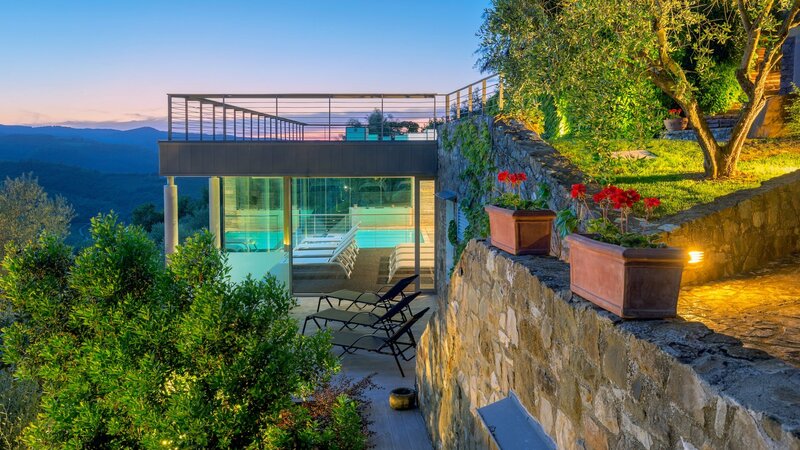 A green fence separates the two properties, therefore the during the day areas and the pool area guarantee privacy. Note that one guest house can not offer complete privacy. 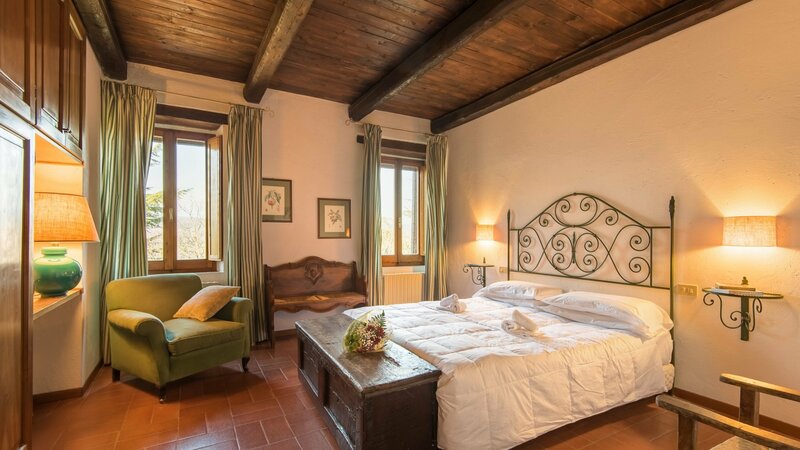 A separate building offers a large 120 square meter room with a panoramic window that overlooks the valley, ideal for parties, equipped with bathrooms and audio equipment. living room with large fireplace (usable by the guests), game room with bar area, TV room with air conditioning, 2 guest bathrooms. 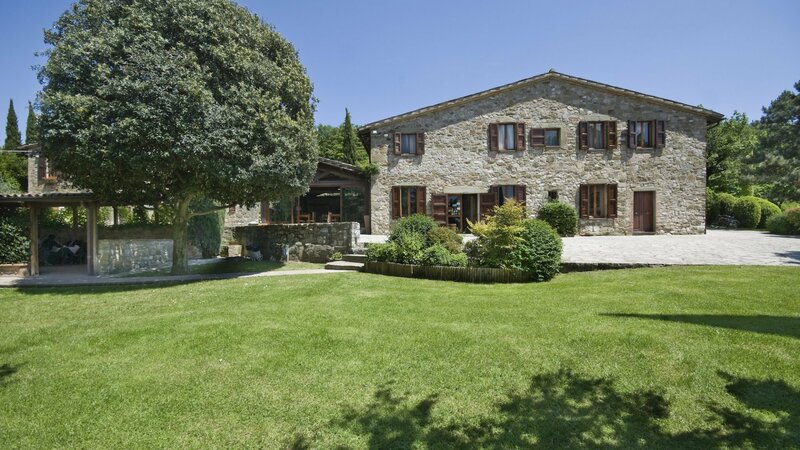 Very large dining room with large windows opening onto the garden, large fully equipped professional kitchen, storage room. bedroom 1: twin bedroom (convertible into a double) with A/C and TV. bathroom with shower. 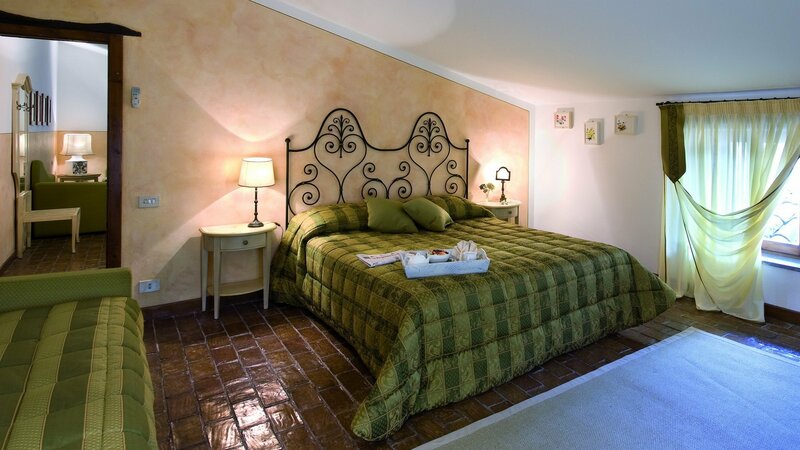 bedroom 2: double bedroom (not convertible into a twin) with A/C, TV and view of the pool. living area with double sofa bed with AC/ and TV. 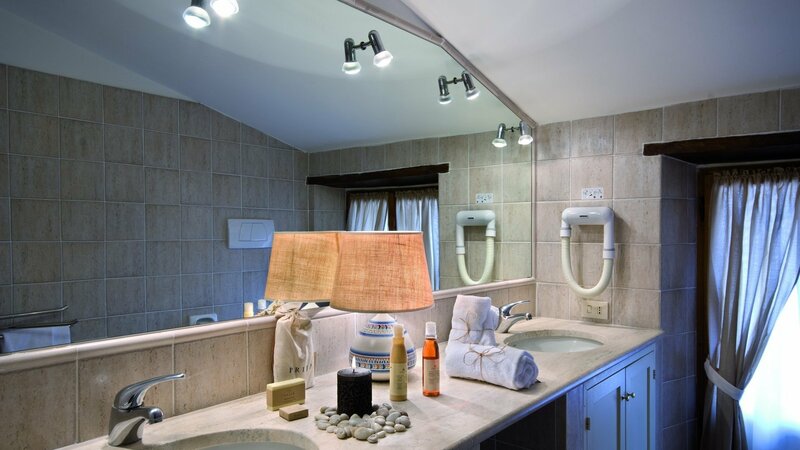 Bathroom with double washbasin and shower (no hand held shower). bedroom 3: double bedroom (not convertible into a twin) with A/C, TV and single sofa bed. bedroom 4: master bedroom (not convertible into a twin) with single sofa bed, A/C, TV and en suite bathroom with bath tub and shower cabin in the tub. bedroom 5: double bedroom with TV (not convertible into a twin), single sofa bed and en suite bathroom with shower (no window, no hand held shower). bedroom 6: double bedroom with TV (not convertible into a twin), en suite bathroom with shower (no window, no hand held shower). bedroom 7: twin bedroom with TV (convertible into a double) and en suite bathroom with shower (no window, no hand held shower). bedroom 8: twin bedroom with TV (convertible into a double) and en suite bathroom with shower (no window, no hand held shower). bedroom 9: double bedroom with TV (not convertible into a twin) and en suite bathroom with shower (no window, no hand held shower). This bedroom is situated next to the electricity/heating cabin which can cause noise). bedroom 10: double bedroom with TV (not convertible into a twin) and en suite bathroom with shower (no hand held shower). bedroom 11: double bedroom with TV (not convertible into a twin) and en suite bathroom with shower (no hand held shower). bedroom 12: twin bedroom with TV (convertible into a double) and en suite bathroom with shower (no hand held shower). bedroom 13: twin bedroom with TV (convertible into a double) and en suite bathroom with shower (no hand held shower). bedroom 14: large double bedroom with TV (not convertible into a twin), single sofa bed, A/C and en suite bathroom with bath tub plus hand held shower. covered outdoor eating area, terrace with view, swimming pool area with gazebo and fridge. Small gazebo with view, outdoor shower (only cold), bathroom with shower. 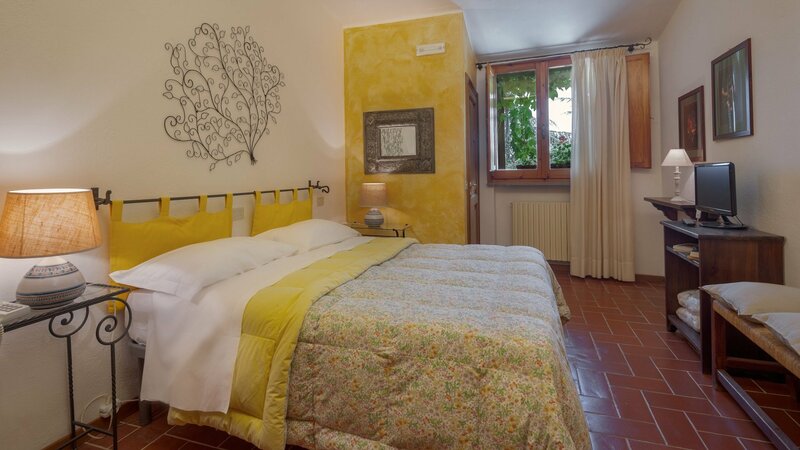 village Monte Castello di Vibio with bars, restaurants, post office, supermarkets 9,6km/5,9miles, horse riding center 11,8km/7,3miles, chemist’s in Madonna del Piano 12,9km/8miles. Hospital in Pantalla 23,6km/14,6miles. pets allowed, non smoking villa. 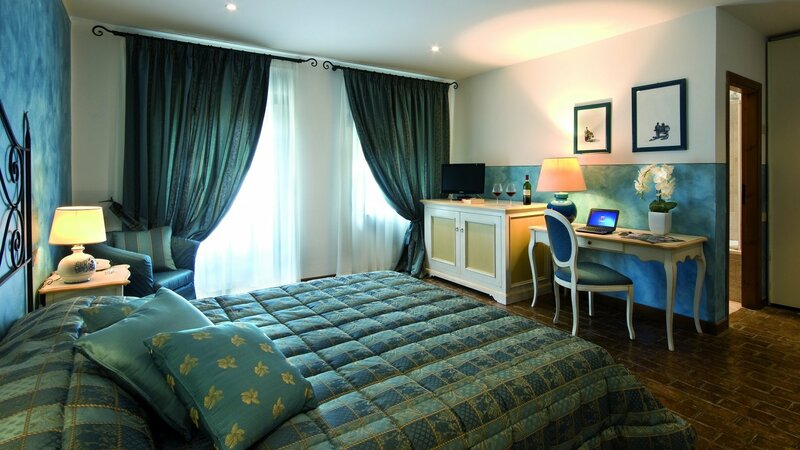 Concierge service, wine tasting, maid service 3 hours 6 days a week, air conditioning, welcome aperitif served by the maid, welcome breakfast. Turkish bath heating EUR 180 per week, indoor pool heating EUR 700 per week (including Turkish bath), heating for up to 14/18 people is EUR 550 per week, heating for up to 18/26 people is EUR 700 per week, heating for up to 26/31 people is EUR 850 per week, heating for up to 42 people upon request, cooking service EUR 300 per meal (serving and cleaning up afterwards included, food and drinks not included) or EUR 30/35 per person for a meat or vegetarian menu (food included, drinks not included), EUR 35/45 per person for a fish menu (food included, drinks not included), breakfast preparation EUR 150 per service plus cost of the food, extra maid service EUR 15 per hour, babysitter service EUR 15 per hour, laundry service EUR 15 per hour. Shopping service EUR 30 plus cost of the groceries (for heavy lists, the cost of the service is EUR 50 plus cost of the groceries). Turkish bath heating EUR 180 per week, indoor pool heating EUR 700 per week (including Turkish bath), heating for up to 14/18 people is EUR 550 per week, heating for up to 18/26 people is EUR 700 per week, heating for up to 26/31 people is EUR 850 per week, heating for up to 42 people upon request, cooking service EUR 300 per meal (serving and cleaning up afterwards included, food and drinks not included) or EUR 30/35 per person for a meat or vegetarian menu (food included, drinks not included), EUR 35/45 per person for a fish menu (food included, drinks not included), breakfast preparation EUR 150 per service plus cost of the food, extra maid service EUR 15 per hour, babysitter service EUR 15 per hour, laundry service EUR 15 per hour. Shopping service EUR 30 plus cost of the groceries (for heavy lists, the cost of the service is EUR 50 plus cost of the groceries). "Me, Elizabeth and all our friends loved our stay in your beautiful resort. Everything was so detailed and lovely, we felt in love with your garden, the sunsets, the gorgeous view and the Fattoria’s rural dimensions, so silent and quite!! We managed to relax 100%, to meditate and have yoga in the garden with the best morning light we have ever seen!! The food was amazing and we had the time to enjoy each other company in a true and genuine environment: the perfect place to gather together, have truthful interactions and be able to settle down one’s own mind, breathing fresh and pure air with the sounds of nature. We will do our best to come back as soon as life gives us the chance!" 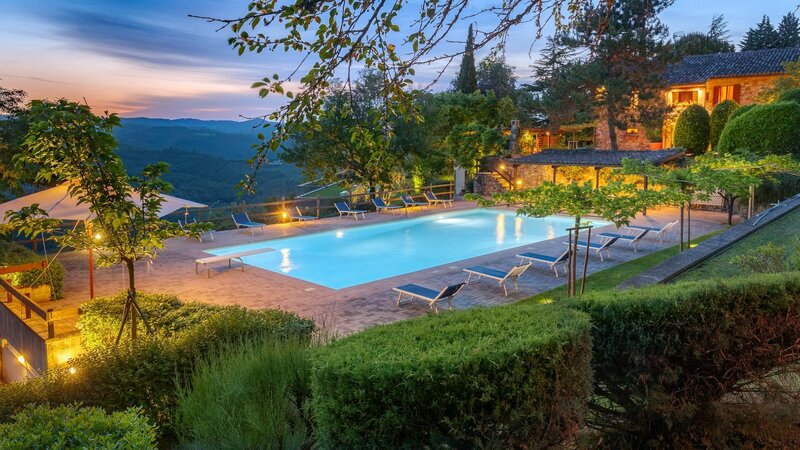 "The most beautiful wedding venue with cypress trees and flowering shrubs, roses, and pots of geraniums everywhere in the Umbrian hills in Italy. 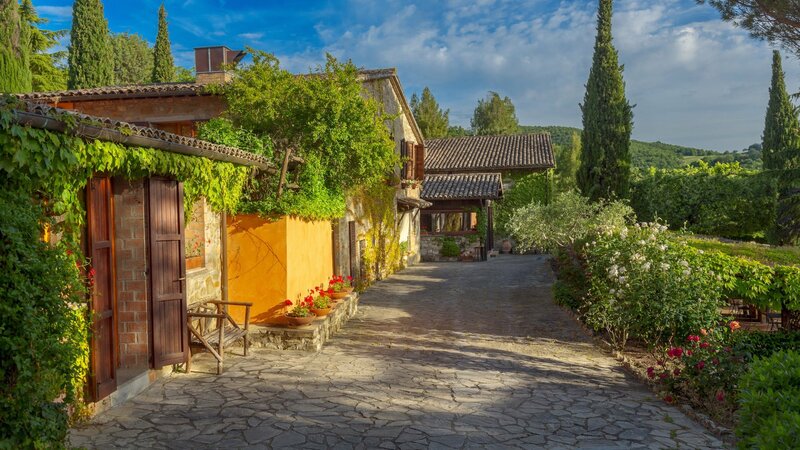 A magical place with superb views of surrounding olive groves, undulating hills and borders full of lavender, rosemary shrubs and gorgeous other plants. The pool area is ideal for relaxing around and catching up with family and friends. Giuseppe, and the staff of the villa looked after us superbly all weekend. The breakfasts were amazing and we had delicious local food all weekend. The bedrooms are comfortable and spacious, though as it started to get hotter at 30c I should have asked for a fan! Thank you for looking after us all so well and giving us such happy memories of a perfect wedding." 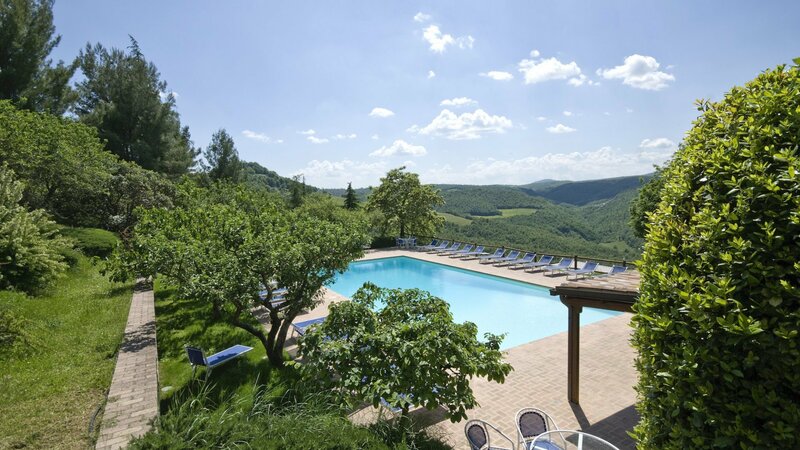 "A beautiful wedding venue in the lovely Italian mountains of Umbria set amongst vineyards and olive groves with stunning views. The country house venue including separate cottages, has many different terraces and bar areas for guests to mingle, including a beautiful swimming pool area, its own gazebo wedding terrace, an inside pool and sauna, outstanding large separate hall in case of a heavy downpour, to mention a few specific areas. Will be back!"